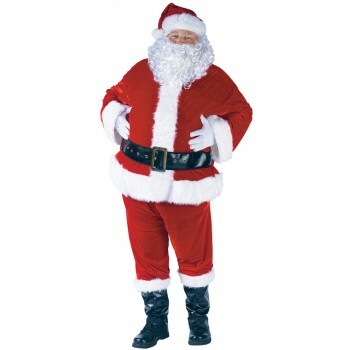 This is our BEST VALUE Santa costume! This version of Santa comes with the lot! This costume has velvety velour fabric that is smooth to the touch and complemented with a white faux fur trim. The jacket is a pull-over with a back closure and belt loops, the pants have side pockets and the wig comes attached to the hat for your convenience. Measurements suits up to 174 cm in the chest and 120 cm in the waist. Wig (attached to the hat) Please note the volume of the wig and beard is less than in the image. Please check out our great range of wigs and beards that we also stock. Was really impressed with the speed in which the costume arrived.